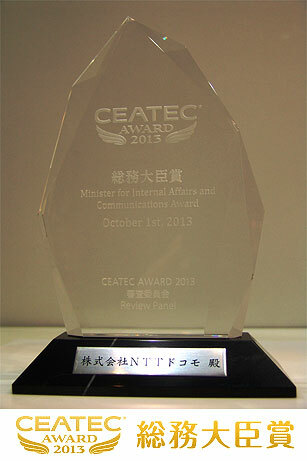 Currently, at Makuhari Messe in Chiba Prefecture being held “CEATEC JAPAN 2013″, DoCoMo’s “next-generation mobile communication (5G),” NTT DoCoMo, Inc. was awarded the “CEATEC AWARD 2013 Minister of Internal Affairs and Communications Award”. In communication technology as the next network of LTE-Advanced, is under consideration with the aim of practical use after 2020, “next-generation mobile communication (5G)” is the originality of the architecture led to the award, such as the height of the solution with respect to the increase in traffic and communication are evaluated. So that as a partner of smart life of each and every customer, life of our customers peace of mind, to become comfortable safe, convenient, DoCoMo will continue working on research and development. It is assumed that future, and use of a wide variety of communication terminals, the demand for rich content such as video is further increased, during the 2020s from 2010, the amount of traffic to increase to more than 1000 times. In anticipation of the traffic surge, even in the 2020s, and aims to provide a comfortable service to our customers, to achieve the ultra-high-speed communication of more than 100 times and ultra-large capacity of more than 1000 times of LTE, to advance the research and development ‘s “next-generation mobile communication (5G)” is (less than 5G). It is a new communication system that follows the LTE-Advanced, which aims to introduce, in 2015 the current LTE. By utilizing the high frequency band that is not currently in use in 5G, to allow communication over a wide frequency band and high-speed communication. In DoCoMo, and enable high-frequency band by the transmission technology that utilizes and phantom cell concept that combines the macrocell to use and small cells to be used for broadband high frequency band, the low frequency band you are currently using, the antenna element of many I am proceeding to focus on research and development of transmission technology to use. In the future, to be able to offer our customers as soon as possible a comfortable communication environment by 5G, leading the international standardization to the realization of 5G, we will promote vigorously research and development.